Product prices and availability are accurate as of 2019-04-17 15:41:32 CDT and are subject to change. Any price and availability information displayed on http://www.amazon.com/ at the time of purchase will apply to the purchase of this product. * ALL 6 VOLUMES NOW AVAILABLE AS A SINGLE KINDLE BOOK! This Complete Edition of the Complete Commentary on the Whole Bible offers details explanations of EVERY SINGLE BOOK AND CHAPTER OF THE HOLY BIBLE'S OLD AND NEW TESTAMENTS. First published in 6 volumes and retailing for over $100 in hardcover ... the Christian Miracle Foundation Press is proud to publish this edition for a price accessible to all. In this chapter we have, I. Christ's discourse with Nicodemus, a Pharisee, concerning the great mysteries of the gospel, in which he here privately instructs him, ver. 1-21. II. John Baptist's discourse with his disciples concerning Christ, upon occasion of his coming into the neighbourhood where John was (ver. 22-36), in which he fairly and faithfully resigns all his honour and interest to him. I. Who this Nicodemus was. Not many mighty and noble are called; yet some are, and here was one. Not many of the rulers, or of the Pharisees; yet. 1. This was a man of the Pharisees, bred to learning, a scholar. Let it not be said that all Christ's followers are unlearned and ignorant men. The principles of the Pharisees, and the peculiarities of their sect, were directly contrary to the spirit of Christianity; yet there were some in whom even those high thoughts were cast down and brought into obedience to Christ. The grace of Christ is able to subdue the greatest opposition. 2. He was a ruler of the Jews, a member of the great sanhedrim, a senator, a privy-counsellor, a man of authority in Jerusalem. Bad as things were, there were some rulers well inclined, who yet could do little good because the stream was so strong against them; they were over-ruled by the majority, and yoked with those that were corrupt, so that the good which they wished to do they could not do; yet Nicodemus continued in his place, and did what he could, when he could not do what he would. 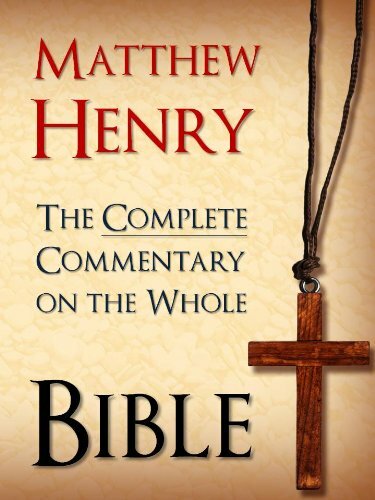 PLEASE NOTE: THIS IS THE UNABRIDGED AND COMPLETE COMMENTARY ON THE WHOLE BIBLE, NOT THE ABRIDGED CONCISE VERSION.